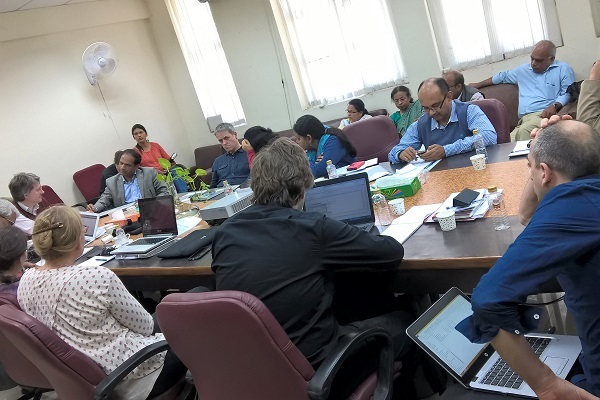 The 2nd NEWS India-UK Workshop was held between 25-26th February, 2017, in the IARI complex, New Delhi India. It became clear from the overviews of the two directors of the project, Mark Sutton and N. Raghuram that the NEWS virtual centre made a strong early start. In the past year also a new co-operation was established. The National Rice Research Institute (NRRI), directed by Himanshu Pathak, had become an official partner of the project. Under Component 4, a co-operation also started with the Indian Institute of Tropical Meteorology (IITM). Regarding the genetic (Component 1), and field experiments (Component 2), substantial work was carried out in the past year. At IRRI in Hyderabad, to identify N efficient genotypes, the genotypic variability was assessed at graded levels of nitrogen. In the same time, at AMU, an organ-specific and stage-specific proteome expression study was conducted on a N efficient and a N in-efficient variety. At IPU a screening of contrasting varieties for N responsiveness was performed. The contrasting varieties were selected from 21 rice varieties ranked by the effect of nitrate, ammonium or urea on germination rate. At UoA, work has been carried out to improve the pipeline of a panel for genetic mapping (GWAS). 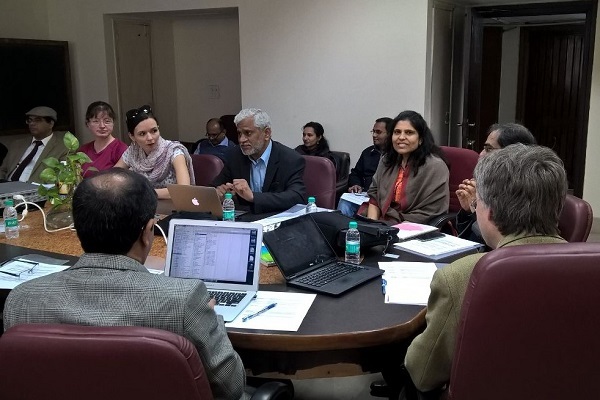 At IARI in New Delhi, a field screening of 10 rice genotypes was carried out during kharif 2016 under control, with the recommended dose of fertilizer and 50% of it. Furthermore, in a comprehensive field experiment, to assess NUE, the components of the N budget were quantified, as well as CH4 emissions were measured for 3 different rice varieties with 5 different fertilizer treatments and 2 different water management methods. Preparatory work has been also started under the modelling components of the project (Component 3 and Component 4). The colleagues at UoA identified the tools to be used in the farm-scale simulations as follows: infoCrop, DSSAT, DNDC, ECOSSE, COOL Farm Tool, and modified version of the BREAD model. 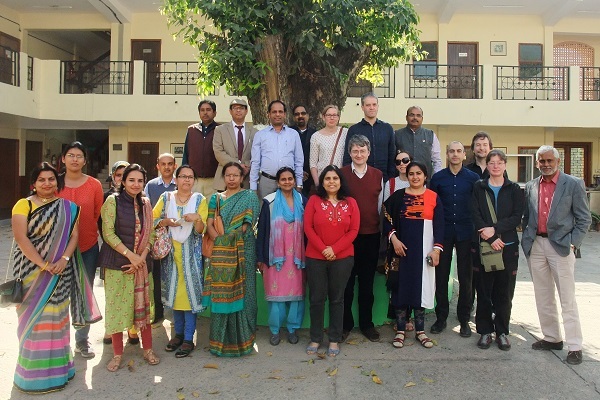 At UoE, preliminary regional-scale model experiments were performed for India with the EMEP model. In Component 4, the development of a new Indian NH3 emission inventory, based on state level data, is also in progress. Under Component 5, the NEWS fellowship scheme was successfully set up in the past year. In the first year of the Fellowship, 2 junior fellows and 6 senior researchers were awarded. In Component 5, the development of the N-MOOC is also in progress. According to the plans, the course material will be available not just in English, but also in Hindi and Punjabi. 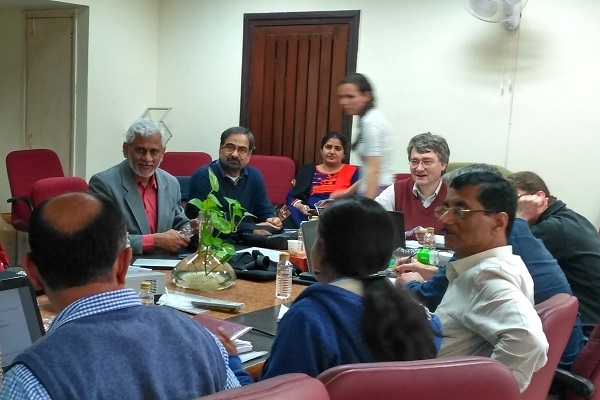 One of the main outcomes of the meetings was a list of 13 rice varieties that will be further investigated for performance (MTU 1010, Rasi, Varadhan, Krishahamsa, Nagina 22, BPT 5204, Pusa 44, Himadhan, Nidhi, Panvel, CRdhan 310, CRdhan 311, IR 64) and a list of 4 varieties examined in the integrated genetics-agronomy experiments (MTU 1010, Pusa 44, IR 64, CRdhan 310). These combined experiments are planned to be carried out at IARI (Delhi), IIRR (Hyderabad) and NRRI (Cuttack) in the next two years, starting in the 2017 monsoon season. In addition to the initial plans, the effect of the application of a urease inhibitor on the components of the N budget will be also investigated. Another field campaign is planned for September 2017 in Cuttack, in which different methods to measure NH3 emission fluxes will be compared, such as: AMANDA, QCL, cuvette, and APLHA samplers. The meeting was concluded with the advisory comments from J.K. Ladha. His main recommendation for the NEWS partners was to strengthen the communication between the research components (including biologists and agronomists), to carefully choose the right varieties and methodologies for our investigations, and also to take cues from the literature to make recommendations for the farmers. The minutes and the presentations of the meeting are available for the NEWS partners HERE. For more photos please see our Gallery!